Website domain names are anything but simple. As silly as it sounds, the right or wrong URL can make a huge difference in your site’s success. So with the .com and .net domains glutted after decades of use, TNW has been extolling the virtues of domains beyond .com for a while. If you’re getting set to launch a new tech-based product or service, it only makes sense to present it to the world under a .tech domain. Right now, you can take advantage of a special TNW Deals price drop to lock in virtually any .tech domain you want for the next decade for $39.99, less than $4 a year. If you like to stay on top of trends, a .tech address does the trick. All the cool kids like Microsoft (rewards.tech), the Consumer Electronics Show (ces.tech), and even our own TNW (tnw.tech) are doing it. 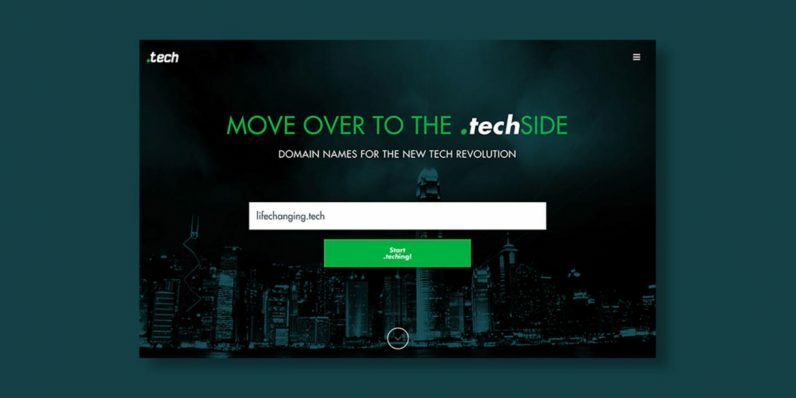 Since you may be thinking beyond what “looks” good (and you should), consider this — the .tech domain allows you to take wider control of your cyber real estate than ever before. In addition to your main address, you can pick up all kinds of related URLs and funnel them to your site. If you’re software company Apex Software at apexsoftware.tech, why not also pick up apex.tech, software.tech or even bestvideogames.tech to help find even more users all over the web? In addition to avoiding all the alternate name spellings, hyphens and other compromises when trying to find a .com domain, a .tech address shows your advocacy for your industry. And again…the price! A 10-year .tech address would normally cost $250, but this deal get it for more than 80 percent off. You can also pick up 1-year ($2.99) and 5-year ($24.99) subscriptions at big discounts before this deal expires.